Keep in mind that both chains sell these roofing panels only in select locations – mostly in Northern states, Midwest and in the South. This is because there is not enough demand in every store. Metal roof panels pricing per sq.ft. What is a corrugated roof? Also commonly known as tin roofing, corrugated metal roofing has a distinct ribbed appearance and is much lighter weight than other types metal roofs. Sheets of metal, usually steel, are bent and folded into grooves and ridges of various sizes. The process of corrugating makes an otherwise thin and flimsy sheet of metal a lot stronger and more durable, making it suitable for a wide range on applications in both commercial and residential roofing. Essentially, this roofing system is made up of sheet metal panels which are held together by exposed fasteners. These metal sheets are manufactured using thin G-60 or G-90 steel, and have a paint coating on top. Some more expensive products can be made from aluminum, galvanized or stainless steel. The panels can be formed into different shapes, hence the names: R-panel, V- panel or U panel. The corrugated grooves facilitate quick shedding of rain water, snow or ice. This is why these metal roofs work so well in Northern states that get regular ice and snow storms. How long does a corrugated steel roof last? One of the biggest benefits of metal roof, including ribbed panels, is how long they last compared to traditional shingles. A properly installed corrugated roof can easily last 30-60 years. This is 2-3 times longer, compared to the service life of most asphalt shingles roof. Also, keep in mind that unlike with asphalt roofing, a steel roof will not require much maintenance over the course of its lifetime, aside from the need to occasionally tighten the screws to prevent leakage. Should I get a tin roof? 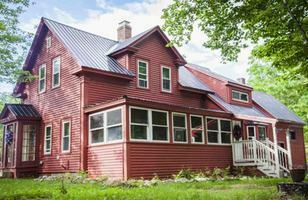 Tin roofing panels used to be exclusively installed on industrial buildings, factories, farm houses and barns. As a result, many homeowners have a misconception that this type of roof would not be an appropriate choice for their house. Others also don’t like the “ugly” industrial look and feel. 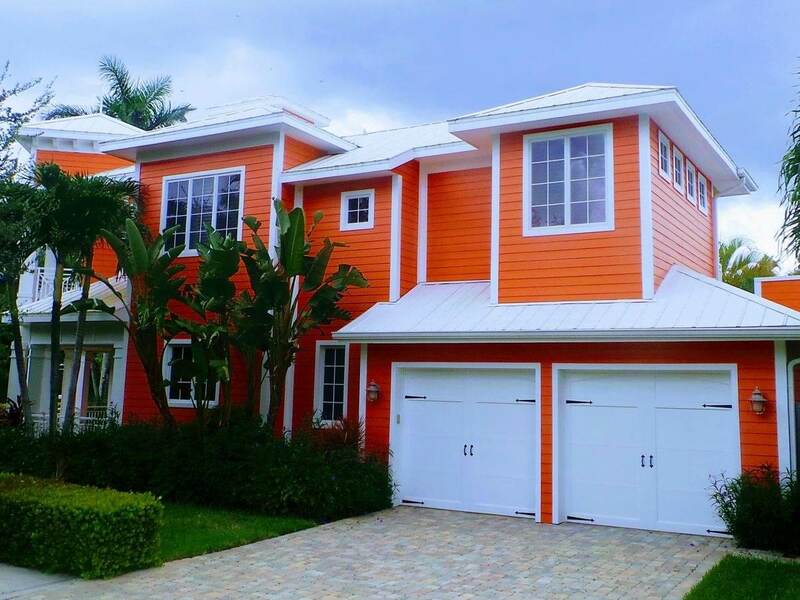 However, today ribbed metal roofs come in a wide range of styles and colors that look very attractive and satisfy the curb appeal requirements for the majority of houses. Tin roofs are also fire, hail and wind resistant, and can provide significant energy savings, compared to asphalt shingles. Moreover, in many states where wildfires are a big problem, homeowners can get a home insurance discount if they install a metal roof. Most budget friendly metal panels (which we will discuss here) are covered with acrylic paint coatings, or are sold as bare metal. However, these can fade and corrode over time. A longer lasting, but more expensive alternative are ribbed steel panels which are covered with a Kynar 500 coating, also known as PVDF. Unlike more expensive metal roofs, which require professional installation, R-panels or other corrugated roofs can be easily installed by a handy homeowner. In some cases, these panels may be installed over existing asphalt shingles, which can further save you money on tear off and dump fees. How much does corrugated metal cost? Compared to all metal roofing options, corrugated panels are the cheapest. They are an ideal, low budget alternative for homeowners who want to get away from asphalt shingles roofing. As with any product, corrugated roofing materials prices also vary. They start from as low as $1 per square foot for unpainted galvalume steel, to as much as $1.5 per square foot for thicker steel and premium Kynar 500 color coatings. You can use our Metal Roofing Calculator to quickly estimate how much it will cost to install this roof on your house. 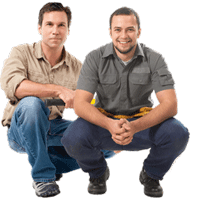 Professional installation also adds a significant amount to the total price tag. Hiring a metal roofing pro to install 5-Rib or 5V Crimp panels ranges from $4.5 to $6 per square foot. Keep in mind that this estimate also includes trim, accessories, underlayment and screws, in addition to the panels themselves. Consequently, if you can do the job yourself, you will save a lot of money (about $3-4 per square foot savings for DIY installation). Your total cost will be about $2 per square foot, which would include all accessories and metal panels themselves. Of course no roofing system is complete without accessories. However, the R-Panel system is the easiest, when it comes to accessories. You have the Ridge Cap, Gable Trim and J-Channel. That’s it. Many homeowners are hesitant about installing a corrugated roof, because they don’t want their home to look like a barn. 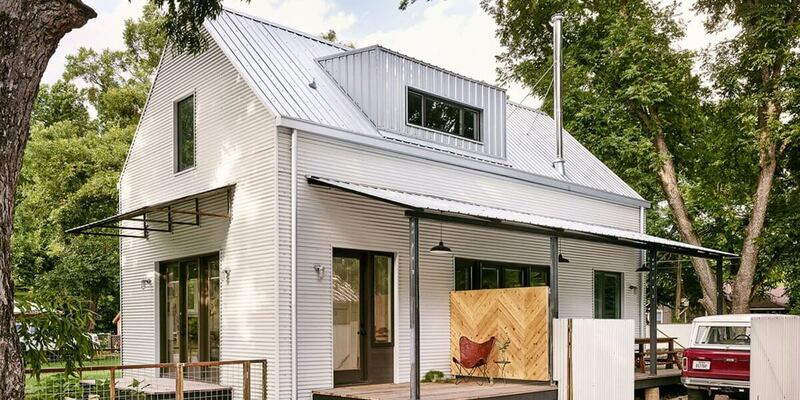 Ribbed metal roofs don’t have a rep for being particularly stylish. However, with recent developments in color technology for metal roofs, this perception is changing. While the cheapest corrugated panels, like the ones sold at Home Depot and Lowe’s, do have a limited color pallet, there are other more attractive options to consider. 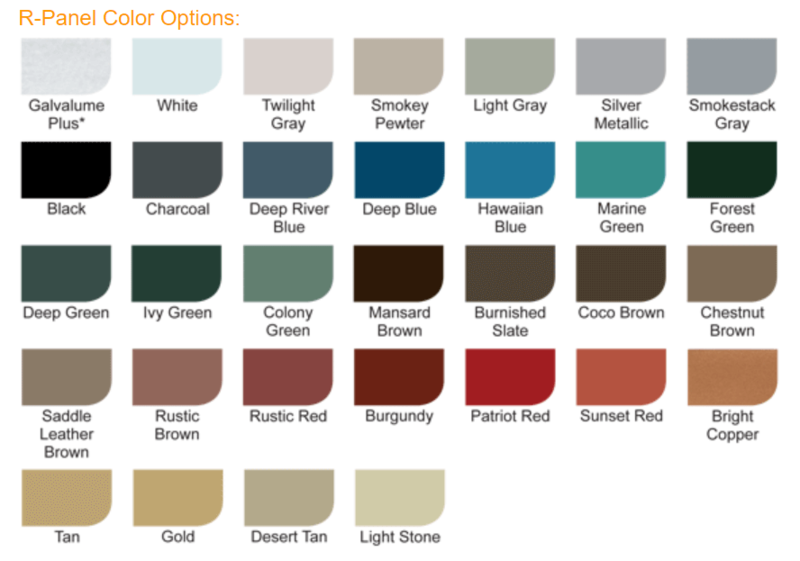 For example, Mueller Inc sells R-panels, with an up to 30 year limited paint warranty in 32 beautiful colors. See the chart below. Clearly, there is a shade here that would complement any siding color or style. Moreover, in recent years there has been a developing design trend for the look of bare metal. 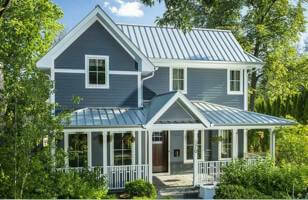 It is becoming increasingly popular on contemporary ranch, farmhouse and barn-style homes. This means if you have this type of home you can save money buy installing unpainted metal panels, while enjoying the trendy curb appeal. Also, you will not have to worry about chipping and fading paint, and spend more money on repainting the roof every 10-15 years. Installing an R-panel roof is VERY easy, until you have to deal with penetrations such as chimneys/skylights/dormers. This product is ideal for simple roofs, farm buildings, sheds, garages, etc. I would not recommend putting it on a cut-up Victorian house! Besides the fact that it will look horrendous, it’s also hard to make it watertight on a cut-up roof. For advanced flashing, such as skylights and chimneys, this is not a very good product – hence you don’t see much of it installed on residential homes. While it can be done with some custom flashing, I recommend that you hire a professional roofer, for any complex flashing details. See this example – here is a step by step chimney flashing done on a metal shingles roof, which is a much more “user-friendly” system, when it comes to penetration flashing. Unfortunately it’s very difficult to do something like this for a 5-rib system, and you will have to rely heavily on caulk and 3rd party / custom-made components. Lowe’s sells corrugated and 5-rib R-panels made by Fabral – a well-known and respected manufacturer. It is important to note that prices at Lowe’s differ a lot depending on the color of the panel! Unpainted Galvalume and Brown colors are the cheapest at $35 and $39 for a 3×12 foot panel, or just about $1 per square foot. Prices for 3×12 ft. panels. If you go for red or white colors, the same size panel will cost $52.98 each, or $1.47 per square foot, which is 50% more than Brown or unpainted. Green color costs $46.98 or $1.31 per square foot. These prices were sourced on February 20, 2019 in Rochester, NH store. In other regions they may be less or more expensive, but I’ve not seen more than a 5% difference. 12 foot panel is the longest you can buy from Lowe’s. However, Home Depot sells these up-to 16 feet long. So if your roof run is more than 12 feet, you will need to cut and overlap, which is not ideal. It is a waste of time and money. See more Lowe’s prices – Lowe’s 5-Rib panel (select your store for accurate local prices). Honestly, I do not know how the company comes up with pricing in different locations, but I’m sure it has to do with demand and cost of delivery. The cheapest price I have found is in Glenville, NY (middle of nowhere upstate New York – north of Albany). It is $32.90 per 3×12′ panel. Highest prices are in stores where these panels are NOT in stock. In Montgomery, AL, our benchmark panels cost $40.38. In Columbus, OH, and Helena, MT the same $40.38. Basically you are paying about 13% premium for delivery to the store. 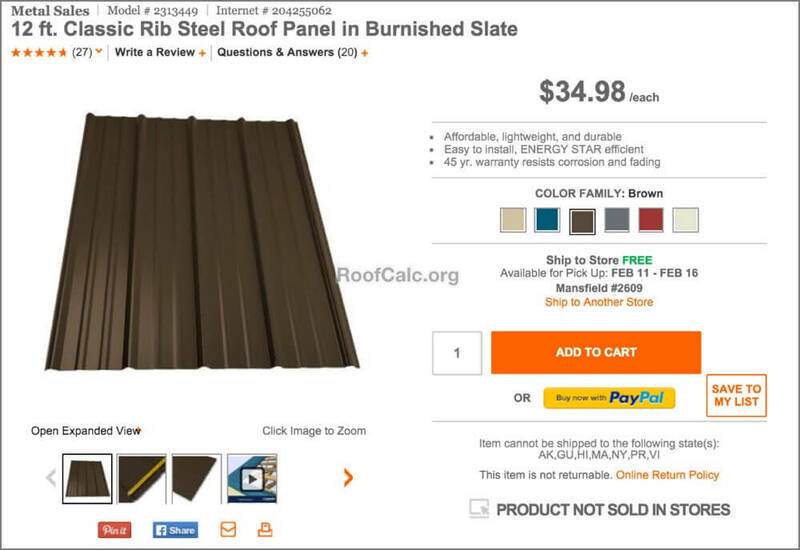 Home Depot sells the same type of 5-rib R Panel made by Fabral and another “no name” brand – Metal Sales Manufacturing Corporation. Honestly, I’ve never heard of them, while Fabral is a big industry player. However, here, you will find much better deals, especially for painted R panels, and you also can buy 16 foot long ones (unlike at Lowe’s). Once again – the cost of corrugated metal varies by state, with about 5% swing up or down. As of February 2019, Home Depot’s price for 3×12 panel is around $36.25 in Rochester, NH, for ANY color, and $34.11 for unpainted Galvalume. For comparison, Lowe’s price for a color panel is from $39-$53, and $35 for Galvalume. The 16 foot products are about $48 each which is the same $1/square foot of the 12 ft. panel. The white color metal panel from Home Depot is 50% cheaper than the same panel at Lowe’s. Only brown colors are similar in price. So there is a pretty big price difference in favor of Home Depot. However, if you consider that Lowe’s sells Fabral (a well-known brand), vs Home Depot’s little known MSMC, the extra cost may be justifiable. At the same time, since all steel used for roofing in the US comes from the same 2-3 manufacturers, and undergoes a similar galvanization process, using Galvalume (for vertical panel steel roofs only), I’d say both brands are very much comparable in quality. Neither specifies Kynar/Hylar resin used in paint, so we can presume that paint is most likely acrylic (not very good). Both cover only paint finish/color fading under their warranties (no rust or corrosion coverage, which is pretty standard for steel roofs). Given the above factors, I would actually say both brands are similar in quality, so Home Depot’s “no name” product clearly wins. Prices have dropped over 20% since 2013! I have gathered more data on Lowe’s metal roofing than any other source, except for the company itself. The good news that I’m happy to share with you, is that since Sep. 2013, when I began tracking, prices for classic rib steel panels have dropped by more than 20%! 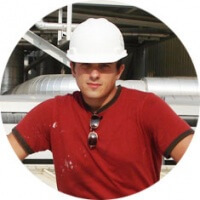 This is great for ALL homeowners (and contractors) interested in finding a CHEAPER price. 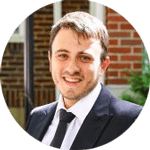 Now, what you will pay will be on par with asphalt shingles, which have had only a marginal change of less than 2-5%, depending on the brand and type of shingle. And this is when crude oil costs a mere $30 / barrel, and oil byproduct (bitumen) is the main and most expensive ingredient in shingles manufacturing. So if we consider that the cost of oil has dropped 3 times since 2013, I would expect a much steeper decline in shingles prices. However, the clever roofing industry is all about profits, and the cost of shingles NEVER goes down, even when oil prices do so, significantly. 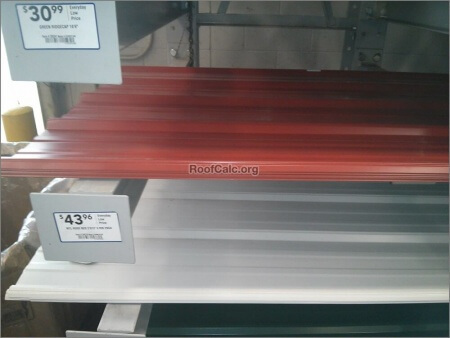 The primary products that both of these stores sell is a 5-rib (R-panel profile) 29 ga steel roof panel with acrylic coating. This is an “exposed fastener system that is VERY easy to install for roofers and homeowners alike. It provides great protection from rain, snow and ice. Unlike asphalt shingles, it is a long-lasting roof covering (with proper maintenance). Its very natural for most DIY savvy homeowners to turn to either Lowe’s or Home Depot for all their building needs, including roofing materials. However in case of 5V Crimp and R panels I would strongly recommend purchasing them from a local roofing supply store. Contrary to popular misconception, you will not be overcharged there compared to what you would pay at a home improvement chain. Prices for metal panels at a roofing supply store will either be the same or only slightly more expensive (5-10 cents more), compared to what you would find at the big box stores. 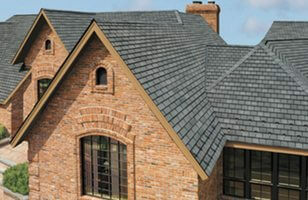 However, there are are great advantages from buying your materials from a roofing supplier. The biggest is that you can CUSTOMIZE the size of your panels. That’s right, for no additional charge (or a very small fee) you can have your panels pre-cut to the size that you need for your particular roof. Buying from a home improvement chain makes you stuck with their standard panel sizes. This can create many issues with the way your roof will look after installation. For example, if you need 19 foot long panels, you can order the exact length panel from a supplier, and have no overlaps / ugly seams. However, if you buy from Home Depot or Lowe’s, you will have to get a 12 foot and an 8 foot panel, overlap them and waste 3 sq. ft. from each 2 panels, because of overlap. These seams will also create a potential for a roof leak, and they just don’t look good. Other benefits to going with a roofing supplier are more options for styles, colors, and coating quality. All of these are very limited in both Lowe’s and Home Depot. At the same time, if you are building a shed or a garage, standard size panels will be just fine for your needs. Both Lowe’s and Home Depot sell Fabral 5V Crimp in 2×12 ft. sizes, and only as unpainted Galvalume (no color options). Each store only sell these panels in select southern states. Unfortunately, shipping to Massachusetts / New Hampshire is not available. This means I can’t buy these panels online and have them shipped to MA/NH. Home Depot’s price is $23.97, while Lowe’s is $2 more, or $25.93. Again, if I was buying this from a big box improvement store, I’d go with Big Orange, given that it’s an identical product. Installing a corrugated metal roof has numerous benefits, especially when you compare it to traditional composite shingles. The biggest benefit is that for pretty much the same price as asphalt, you can have a durable metal roof that will protect your house for twice as many years, with minimal maintenance. Still there are some downsides to keep in mind. This includes possible corrosion of the fasteners, color fading, and the need to re-fasten the panels every 10 or so years. Standing seam metal IS THE ONLY WAY to go. No visual fasteners to leak!! we got 2 qoutes here in ukiah ca $24,000 and $32,000 blackberry metal with a moisture barrier.we have two disabled kids.please our grandfather of ukiah areas Archiect Mike Tyrrell passed away.we need help the average cost is very low compared to our price given in Ukiah ca for 2000 sqf home. we despretly need help.the supplies alone $8000 /$10,000 ..if a handman can come up and help us it would be very much appreciated with our graditude for any siggestions of a retired roofer or a believer in our father God giving his help.a roofer with tools may the lord bless u abundently. can you give me your price on 14′ R-Panel roofing please? Ken, it should be about the same price as 36″ r-panel (per square foot that is)… However I’ve never seen 14″ … I know of a 24″ panels that are similar to R-panel – it’s called V5-crimp … and prices are about the same – $1/square foot, material only, no accessories. 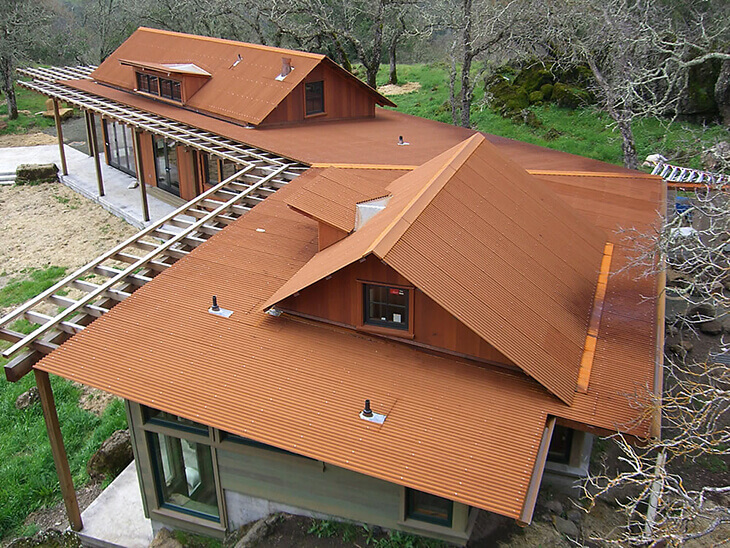 Is it possible to get metal roofing for an outside deck that is terra cotta color on both sides? You will not be able to buy something like this at a Home Depot/Low’s. They don’t carry it and both stores are not flexible enough to order it for you. Your best bet is to find a local metal roofing supplier, such as Coastal Metal (division of Beacon Supply) – these guys can order custom color coil, and form it for you in any length. The UNDERSIDE will still be white, so you will have to spray paint it or something … you CANNOT get both sides in terra-cotta. However, since the underside is not exposed to the elements, spray paint should hold well for many years, even if it’s an open structure.